Recently, I was thinking about the musician Pete Seeger, who died in January at the age of 94 after a long life of activism. One of his more famous songs is “Where Have All the Flowers Gone?” and this title made me think of all the SEO specialists there once were, and how lately I haven’t heard much about them. As the head of a digital marketing company that offers SEO among its services, I think I can answer that question: The best SEO experts have expanded their skill set to become content marketers. Once Google introduced the Hummingbird algorithm, the tried and true SEO tactics just weren’t that effective anymore. On its own, old school SEO is no longer able to put a brand at the top of the SERPs. Black hat tricks are especially ineffective, since Hummingbird actively penalizes pages that show evidence of keyword stuffing, link spamming and other questionable practices. Even squeaky-clean white hat maneuvers are, in most cases, not enough. Today, the path to great rankings is all about quality content. There is a good tool for a GMB listing developed by Local Viking company. It helps to to showcase your Google My Business results meaning that you can schedule GMB posts, track snack pack rankings and manage all from one dashboard. Sounds convincing, don’t you think? Google designed Hummingbird to provide an optimum experience for its customers. The point is to deliver search results that are highly relevant to each individual user, rather than merely responsive to meta tags and other technical signals. The algorithm is so advanced at this point that it actually tracks each user’s history and provides contextual results most likely to match the user’s intentions. Content that is poorly constructed, lacks continuity, contains misleading links, is recycled or is sub-par in some way will be automatically screened out of the SERPs. What this means for SEO is the content of every page must be original, well written and transparent in its subject matter and citations. Then, if the content is appropriate for a particular user, the page will probably appear in the search results. Sure, it’s still important to write clear titles, use subheadings and the like, because that does signal to a web crawler that the page comprises quality content. But most important, the content must satisfy the needs of the user. This is good for Google and for the rest of us. We all benefit when users, ourselves included, have a good Web experience. This brings me back to my earlier point about SEO people now billing themselves as content marketers. While some seem to have simply glommed onto the label, others are the real thing. In fact, for some time now, I have viewed myself and my colleagues here at Advice Interactive as content marketers. We haven’t just jumped on the content bandwagon, though. We’ve been marketing content all along. It’s just that until recently this type of expertise went by some other names: digital marketing, Web writing, social media and, yes, SEO. Good SEO has always included smart content promotion. So going forward, my colleagues and I will be talking a lot about content marketing—on this site and in other spaces as well. I hope you will join me in exploring this new terrain. 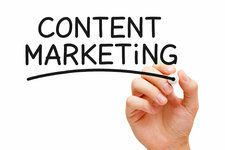 Together we can identify and master the most effective ways to market quality content. Home BlogWhere Have All the SEO People Gone?